Down with the Empire is a game that uses a common theme of science-fiction sagas: A Stellar Empire that has gone rotten, and a rebellion that rises to bring it down. It is primarily a two-player game, although it is possible to have more than one player per side by dividing forces or tasks. The game can also be played solitaire. 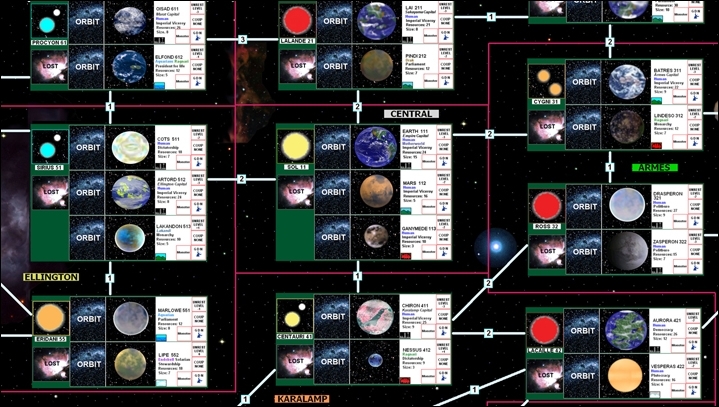 The game system is inspired in the old Freedom in the Galaxy game from SPI. 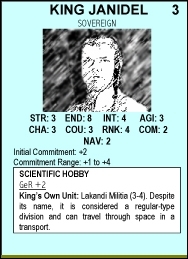 There are two major factions in the game, each controlled by a player. The Stellar Empire owns everything at start, and strives to maintain the status quo through its military might. 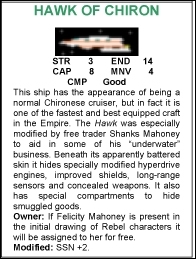 The Rebel Concordance player owns nothing but a few characters and spaceships at start, but by causing unrest and rebellion throughout the Empire, he hopes to get resources that will allow him or her eventually to meet the Empire on equal terms. The game presents you with action at very different scopes. First, you have to administer 50+ planets on a grand-strategic scale, with social, economic and political aspects that are tightly intertwined and can be handled in very different styles. Then you will be in charge of large military units; starfleets formed by individual starships ranging from tiny fighters to mammoth battlestars, and ground units (legions, brigades and divisions) to slug it out on planet surfaces. War in space is a very complex affair, since you can't establish battle lines or prevent the enemy from hyperjumping to any location on the map… He who defends everything defends nothing, goes the maxim, and quick response is the key to victory. Finally, the heart and soul of DWTE are the individual characters. As in all great space adventures, the huge starships may bumble about, but they do not determine the fate of the rebellion saga as much as the astounding contributions of a handful of heroes. The characters perform missions through which they hope to sway the people to join and support their cause, undermine the plans of the enemy and further their own side's goals. During the missions characters face all sorts of dangers, including firefights with lasers blazing against enemy soldiers or monsters, cantina brawls with unruly civilians, getting lost in wormholes, or such everyday occurrences as meteorites falling on your head! A grand-scale science-fiction strategy game, which at the same time has a very detailed combat system with individual spaceships and ground military units, and a role-playing aspect with individual characters performing heroic deeds. The wide variety of events in the game and the ramifications derived from players' choices and styles of play ensure that no two games will play alike. It is a large game with a moderately high level of complexity, but once the rules are learned the game itself flows easily and the on-map counter density is not high. DWTE appeals especially to SF-buffs with an interest in space adventures and sagas, although its fascinating game system will be interesting and challenging for any gamer. The rules are written in a clear language with extensive explanations and examples of play. They have a logical, easily-referenced order and should not present any special difficulty even for inexperienced players.